I received this email promoting AussieBum's new and improved website. Check it out here! 2008 Kansas City Gay Film Festival Winners! The Kansas City Gay & Lesbian Film + Video Festival announced the winning films from their 2008 showcase at the Tivoli Cinemas in Westport. The Audience Award for Best Feature Film went to the musical fantasy WERE THE WORLD MINE, a spirited twist on Shakespeare's A MIDSUMMER NIGHT'S DREAM. Festival audiences also chose CHRIS & DON: A LOVE STORY, the true-life story of the passionate, three-decade relationship between author Christopher Isherwood and artist Don Bachardy, as the winner of Best Feature Documentary. Over a thousand ballots were cast in this year's competition which also drew some of the highest overall scores in the festival's history. Want to go to the theatre? 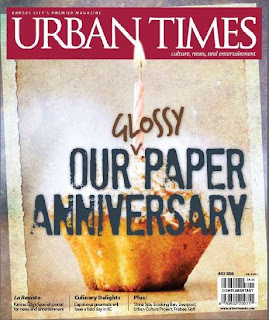 Urban Times Magazine is celebrating its first anniversary! When the magazine came out it immediately caught my eye, the content and design are great! My best wishes to Christina Boveri and her team of professionals that month after month work to provide us with one of the best magazines in town. Here is for many, many more years!